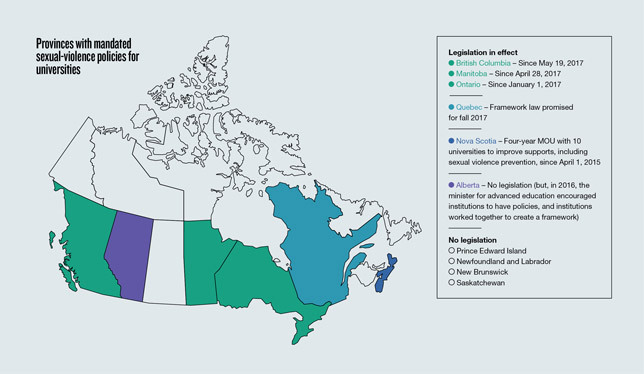 Legislation in three provinces mandates that postsecondary institutions adopt stand-alone sexual violence policies starting this year. When Jen Sugar was hired as director of student affairs at Carleton University in August 2016, staff there had been developing a sexual violence policy for about a year, spurred by legislation mandating such a policy at all Ontario universities and colleges. Earlier that summer, as part of Bill 132, the Ministry of Training, Colleges and Universities issued guidelines clarifying that the policies should reflect diverse student consultation, and outline supports available to students and the process of reporting incidents to the university. This past January, all Ontario universities were required to have a stand-alone sexual violence policy in place. The deadline for British Columbia postsecondary institutions was May 19, and similar legislation took effect in Manitoba on April 28. In Nova Scotia, students have been pushing for legislation, but a bill that would mandate such policies has not passed first reading in the legislature. Nevertheless, the provincial government and the province’s 10 universities signed a memorandum of understanding in June 2016 that, among other things, requires the universities to have specific sexual violence prevention policies. In February, the Quebec government announced plans to introduce a bill this fall addressing sexual violence on campuses. Chief among the goals of sexual violence policies is to provide more transparency about the process of reporting incidents to the university and to ensure investigations are handled in a timely way. Although universities already had ways of addressing sexual violence involving staff, faculty and students, existing practices may not have been formalized. Often, protocols are embedded in other policies such as a student code of conduct or collective agreement. The path of action “all depends on the relationship between the person who is accused and the university,” said Deb Eerkes, director of student conduct and accountability at the University of Alberta. Ms. Eerkes led the review of U of A’s protocols last year, which resulted in the creation of a new sexual violence policy. She explained that there is an important distinction between reporting – a broadly used term that may include formal or informal complaint – and disclosure. “Disclosure is just, ‘I want to tell somebody, and maybe I want an exam deferred or to move to a different residence, but I don’t want you to do anything to that person,’” Ms. Eerkes said. “And a complaint is the formal request to ‘please investigate and lay charges’ [through a university tribunal].” Importantly, universities cannot launch criminal investigations, which is the jurisdiction of the police. At U of A, staff at the sexual assault centre noticed that disclosures far exceeded the number of formal complaints – a common observation among institutions – which raised the question of whether survivors were receiving adequate supports, Ms. Eerkes said. “There’s sort of a myth around campus that we cannot do anything for you unless you make a written complaint. That is not true.” Supports might include academic accommodation, safety planning, counselling, medical care, referrals to community services, and more. In the absence of a sexual assault centre, many universities have had equity or human rights offices handling a wider array of harassment and discrimination complaints, which encompasses sexual misconduct complaints. How universities handle reports of sexual violence has been a topic of public scrutiny over the past several years, with many media outlets quoting complainants who felt the process on their campus did not serve them well or was not transparent. In some cases, complainants have sought redress and institutional change through human rights tribunals, as opposed to the criminal justice system. Ryerson University was one of the first universities in Ontario to begin consultations and pass a stand-alone policy on sexual violence, which was approved in June 2015 and later reviewed in light of the guidelines issued by the provincial government. “Our original policy was about support and education, and indicated that any complaints would be handled under our human rights policy, but the legislation indicated that the process for handling complaints couldn’t refer to another policy,” explained Heather Lane Vetere, Ryerson’s vice-provost, students. The government was specifically asking for stand-alone policies outlining “how does someone make a complaint, what’s the investigation process and the decision-making process,” Dr. Lane Vetere said. University administrators in Ontario are also anticipating that the government may ask them to track data with respect to the policies. This could potentially pose some challenges to institutions, given that there are different ways of naming and handling incidents of sexual violence, on and off campus, making it difficult to compare data across institutions. Furthermore, a single disclosure or report often goes through several offices and staff, some of whom have professional codes of ethics around disclosing information about their clients. In 2015, a CBC investigation seeking to find data on sexual assault on Canadian campuses found that 700 incidents of sexual assault were reported to 87 Canadian universities from 2009 to 2013. The investigation also identified gaps in data, making comparisons difficult in part because universities have different reporting procedures and serve different communities. Several factors may impact levels of reporting. In Ontario, for example, institutions must state in their policy that formal complaints are not required in order to access supports. At the University of Toronto, consultation spanning its three campuses started in November 2014. A policy was approved this past December, and the university will create a sexual violence centre to serve all three of its campuses. As with other universities, administrators received much feedback, including divergent opinions and dissenting voices. Terry McQuaid, U of T’s executive director of personal safety, high risk and sexual violence prevention and support, said “the university is always engaged in consultation and open to feedback, because we are in the early days of the new policy.” She added that an expert panel is seeking input from students, staff and faculty on a robust education and prevention strategy. Prevention and education around sexual violence are two other pieces universities are striving to address, within and outside of their policies. Some initiatives have been student led, such as the Sans oui, c’est non campaign by the Fédération des associations étudiantes du campus de l’Université de Montréal, and in which all Quebec postsecondary institutions are now participating. Other initiatives across the country range from workshops on bystander intervention to university-wide prevention efforts.